March through the neighborhood, 11/8/13. The Hernandez family – Ludim and Gabriela, their three daughters Kriscia, Yelinne, and Litzy – refused to be evicted from-the Southwest Detroit home where they’ve lived for over a decade. 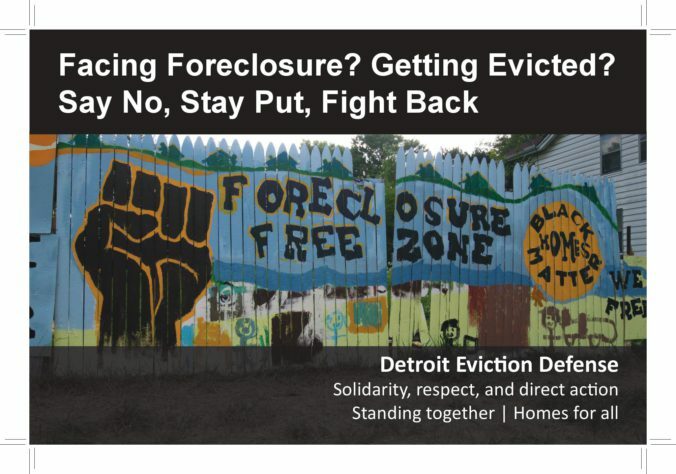 In the fall of 2013 an outpouring of people rallied for the family, to stop the unfair eviction ordered for September. 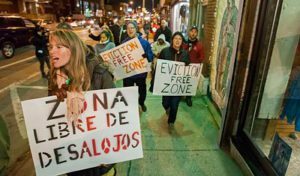 We marched, organized in the neighborhood (including a Halloween party), and camped out in a non-stop vigil at the home until the eviction order expired two months later. 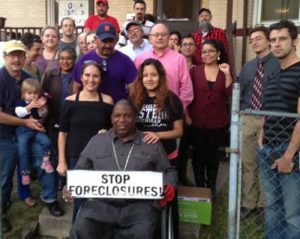 When they tried to buy back their home during the foreclosure process, the family got fleeced out of their life savings of $15,000 by Kenneth Sandoval, a wealthy man who presented himself as a mortgage representative. But after DED twice visited his home, alerted neighbors, and complained to the Attorney General, Sandoval had to leave his luxury home, was arrested, sentenced and imprisoned. The stolen amount was returned to the family, which used it to buy the home back. Hernandez family and supporters celebrate victory. Fanny Mae, which took over the home after foreclosure, finally relented on its systematic refusal to sell homes back to the families living in them. After demanding absurd amounts for a home in a neighborhood hard hit by foreclosure, it finally agreed to a reasonable price and sold back the home in the summer of 2015. When Excellent Schools Detroit heard about the Hernandez family’s fight against being evicted from their Southwest Detroit home, they came out to talk with the family’s three daughters, Kriscia, Litzy, and Yelinne. The three explain the effect that the process has had on them, as the community rallied together with Detroit Eviction Defense to try to put a stop to this life-altering event. ¡No más! from Excellent Schools Detroit on Vimeo.